The Palm Beach Central Broncos celebrate their reclaiming of the Outback Rivals Cup. 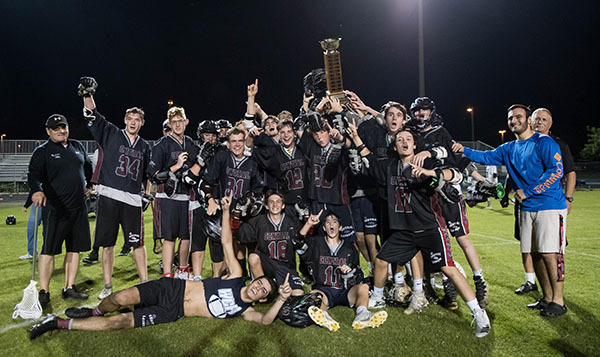 The Palm Beach Central High School boys lacrosse team traveled across town to take on host Wellington High School on Friday, April 5 and bested the Wolverines 11-7 for a big win. The victory marks the first in four years for the Broncos against Wellington, and in the wake of their performance, Palm Beach Central reclaimed the Outback Rivals Cup. The Broncos (9-3) jumped out to an early 3-0 lead in the first period. Wellington began to pressure and have an edge in possession, firing four shots on goal, but Palm Beach Central goalkeeper Anthony Brodrick denied them the back of the net. The Wolverines eventually closed the margin in the final minute with a goal, but Bronco attacker Ryan Rundell hit back-to-back goals crossing over the first and second quarters to extend the Palm Beach Central lead to 5-1. Wellington responded minutes later after both teams battled for possession. Aaron Thompson launched a ground-ball goal to get the Wolverines within three, but they still trailed 5-2 midway through the second period. The two teams traded goals, with Bradley Freeman hitting two and Wellington’s Teddy Miloch getting one. By the end of the first half, Palm Beach Central led 8-3. The Wolverines pushed the action, scoring within the first minute of the second half. Refugio Perez passed to Miloch, who drilled the ball into the back of the Bronco net to make the score 8-4. The Broncos immediately responded when midfielder Logan Rohak drove in back-to-back goals to extend the Bronco lead to 10-4 to end the third period. Wellington saw the cup slipping away, and they needed to pressure in the final period. The Wolverines responded with three unanswered goals to close the gap to 10-7. The Broncos pushed back, determined to reclaim the cup after four years. They added one more goal in the closing minute of play to secure the 11-7 victory and take back the Outback Rivals Cup. With the win, the Broncos improved to 9-3, while Wellington fell to 7-6. Five different players scored for the Broncos. Josh Jacobs had a goal, while Chris Conley, Rundell, Rohak and Freeman recorded two goals each. Miloch is credited with two goals for Wellington.